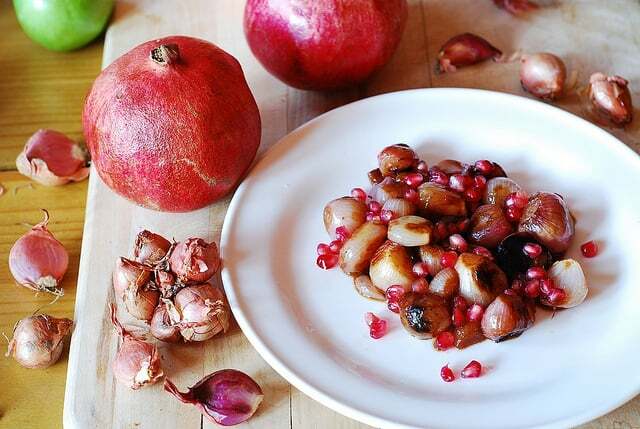 Creamy Balsamic-Braised Shallots with Pomegranate – shallots cooked in red wine, balsamic vinegar, brown sugar, with a touch of cream, sprinkled with Pomegranate seeds. This recipe BELONGS to any winter menu as a side dish to fish and many meats, such as steak, prime rib, pork loin. 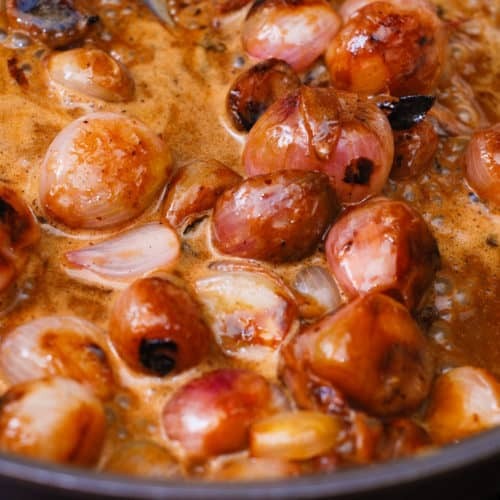 As I am looking to incorporate pomegranate seeds into various dishes I found this recipe for creamy balsamic-braised shallots with pomegranate that can serve as a wonderful side dish to fish and many meats, such as steak, prime rib, pork loin. 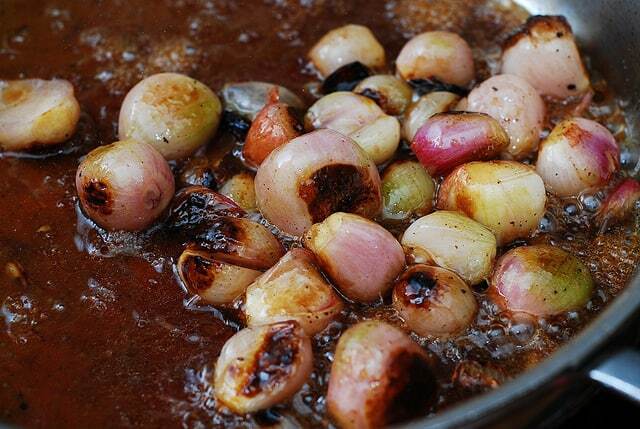 The original recipe calls for cipolline onions or small boiling onions. I used shallots, which worked really well. The dish looks pretty, too: caramelized shallots in a dark balsamic sauce with red pomegranate seeds scattered on top. This recipe BELONGS to any winter menu as an accompaniment to fish or rich meat. I had both steak and fish with this as a side, and I’ll soon be posting a recipe of black cod with creamy balsamic-braised shallots. Another great thing about this recipe is that it can be made in advance and chilled, and served the next day or even a couple of days later, like I did it. Don’t chill it with pomegranates mixed in, pomegranates go on top only right before serving. You can also drizzle just a bit of heavy cream over the onions, and then top the onions with pomegranate seeds. Some step-by-step photos are below. For complete recipe, scroll down. adding chicken broth, balsamic vinegar, red wine and brown sugar and bringing mixture to boil. See the bubbles? 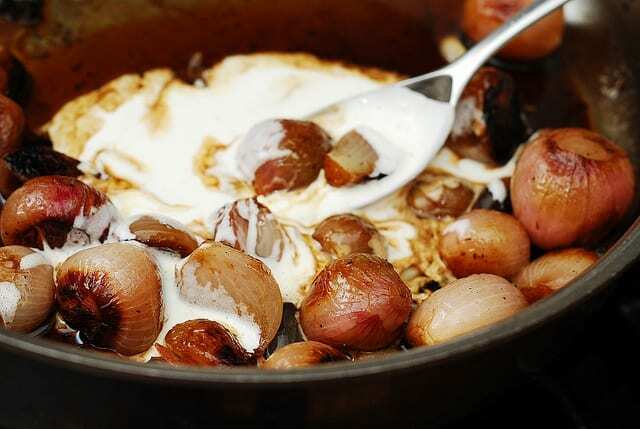 Creamy Balsamic-Braised Shallots with Pomegranate - shallots cooked in red wine, balsamic vinegar, brown sugar, with a touch of cream, sprinkled with Pomegranate seeds. This recipe BELONGS to any winter menu as a side dish to fish and many meats, such as steak, prime rib, pork loin. 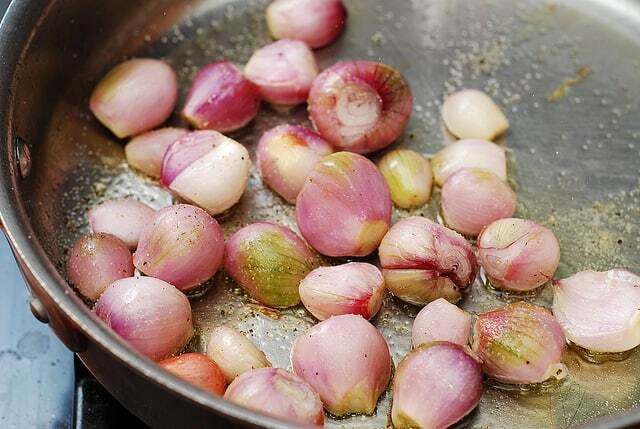 Bring a large saucepan to boil, submerge shallots in boiling water for 1 minute. 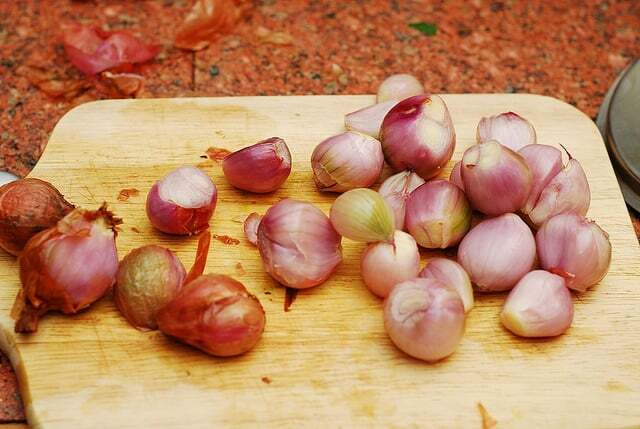 Drain, peel, trim each shallot from both ends, leaving the core intact. Heat oil in a large skillet over medium-high heat, add shallots, saute until browned, about 10 minutes. Add chicken broth, red wine, balsamic vinegar, brown sugar, bring to boil. 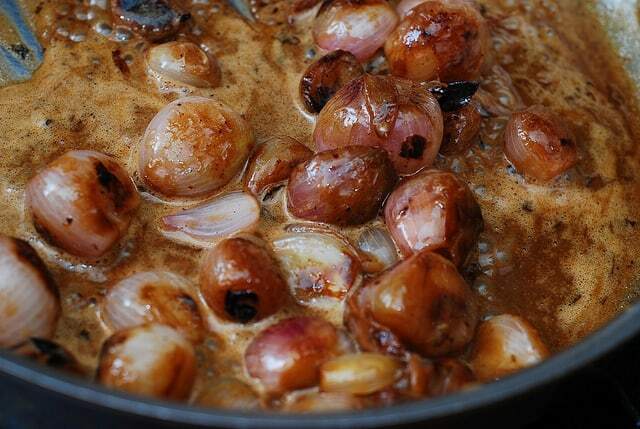 Reduce to low heat, and simmer the shallots on low heat for about 20 minutes, covered, stirring and checking periodically if liquid has thickened and reduced. The sauce should thicken after 20 minutes and if it’s not thick enough, you might have to boil liquid with onions uncovered for several minutes until it thickens. Reduce heat to very low simmer. Stir heavy cream into onions and the sauce. Simmer sauce on low for about a minute so that sauce reaches even consistency with heavy creamed stirred in. Remove from heat. Season with salt and pepper to taste. 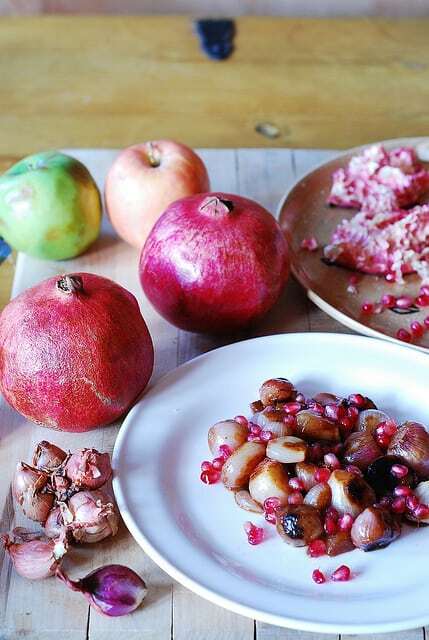 When serving, sprinkle with pomegranates. Adapted from Bon Appetit, November 2007. Wow! What an interesting combination of flavors! 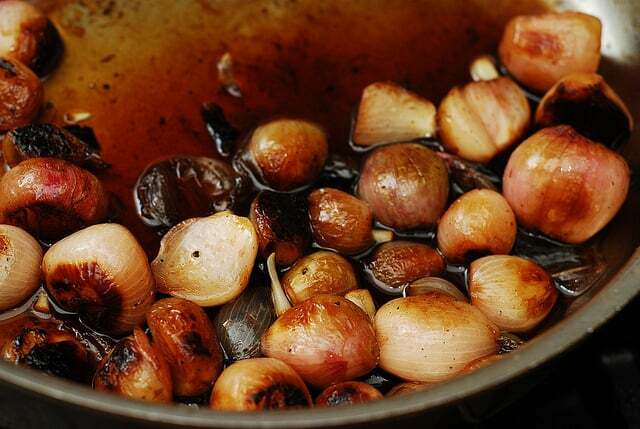 I love using shallots- must try this recipe! 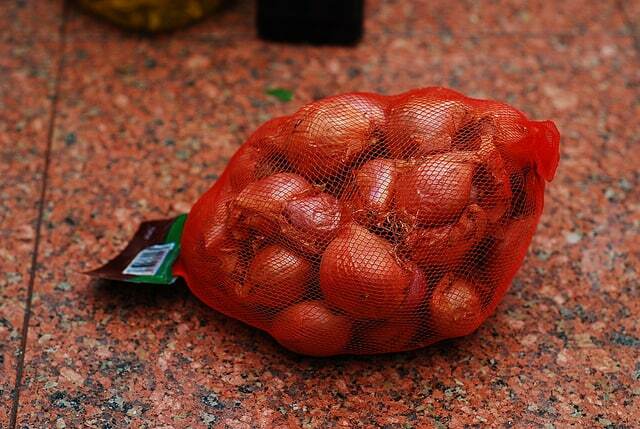 I love shallots and onions of all kind. Those look like the perfect side dish to anything. Balsamic is also one of my favorite flavors. So great that it can be made ahead of time too. I have been thinking about buying black cod at the store for a month now, but then I go with salmon, halibut, or striped bass, my typical stand bys. Can’t wait to see your recipe. Then I’ll have to try it for sure. Crazy about poms and shallots here.